I've discovered that marshmallows are an ideal do-ahead party treat, as they stay fresh for up to three weeks---I'm discovering a lot about homemade marshmallows these days. It all started with this batch featuring toasted coconut. Alright, so I may be the last one to jump on the homemade marshmallow bandwagon, but the point is, I'm here now and very happy about it. I'm still holding out on the trendy cake-pops and macarons, or macaron-pops, for that matter. While I admire them (and the talented individuals that create them) immensely, I just don't have that kind of time. Marshmallows, however, I can do. They can be whipped up in a mere 15 minutes, perfect for squeezing in during a hectic day. And I do mean 'whipped up'; do not attempt these without a stand mixer, as it does the brunt of the work. This recipe was straight out of my new Gourmet Today cookbook, and are pretty darn fine. I loved the contrast of the chewy toasted coconut with the oh.so.soft marshmallow interior; however, the coconut police (a.k.a, Danny) had issues with it. Since then I've played around with a few other versions, which I'll be bringing you eventually. 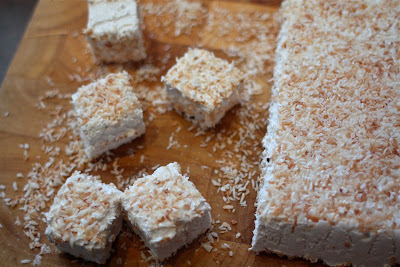 For now, these are a wonderful starting point, provided you like coconut! To avoid stickiness, make the marshmallows on a dry day. The marshmallow squares keep, layered between sheets of parchment paper in an airtight container, in a cool, dry place for up to 1 month. 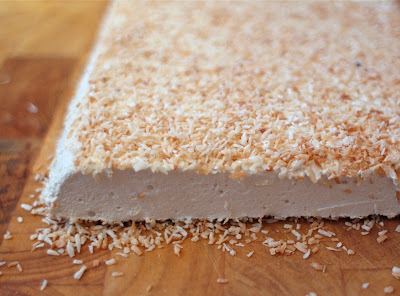 Toast coconut on a baking sheet in oven, stirring occasionally, until golden, 7 to 10 minutes. Remove from oven and cool. Lightly oil a 9-inch square baking pan. Sprinkle bottom with 1/2 cup toasted coconut. Sprinkle gelatin over 1/2 cup water in bowl of mixer and let soften while you make syrup. Combine sugar, corn syrup, remaining 1/2 cup water, and slat in a 1- to 2- quart heavy saucepan and heat over low heat, stirring, until sugar has dissolved. Bring to a boil over medium heat, without stirring, washing down any sugar crystals from sides of pan with a pastry brush dipped in cold water. Insert thermometer and boil, without stirring, until it registers 240F (soft-ball stage). Remove from heat and let stand until bubbles dissipate. 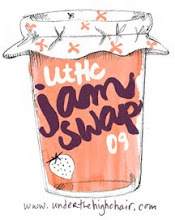 With mixer at low speed, pour hot syrup into gelatin in a thin stream down side of bowl, being careful to avoid beater. Increase speed to high and beat until very thick, about 15 minutes. Add vanilla and coconut extracts and beat for 1 minute more. Spoon marshmallow mixture over toasted coconut in baking pan and press evenly with dampened fingertips to smooth top (it will be very sticky). Sprinkle top evenly with 1/2 cup toasted coconut. Let stand, uncovered, at room temperature until firm, about 2 hours. Run a sharp knife around edges of marshmallow and invert onto a cutting board. Cut into 3/4-inch-wide strips, then cut each strip into 3/4-inch squares. 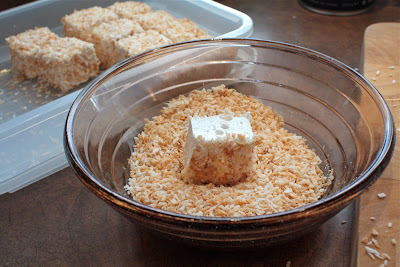 Put remaining toasted coconut in a small bowl and dredge marshmallows in it to coat completely. The toasted coconut makes these extra special! Thanks so much for getting the recipe up on your blog! I'm going to try it!! 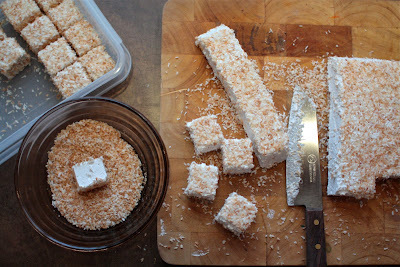 Maria, there are very few recipes that benefit from toasted coconut. In my opinion, it was the marshmallows themselves that were extra special, and the coconut had nothing to do with it. You should try the vanilla version - a much cleaner texture, and much better marshmallow experience overall. I haven't jumped on the homemade marshmallow bandwagon either, but am really thinking I need to now. 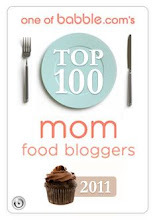 I assumed they were incredibly labour intensive and always skipped over any recipes I came across. I think I may give this a shot so my boys can enjoy them in some hot cocoa. lovely yumminess. I'm almost positive my mom made something similar when I was a kid... I'll have to ask her! These truly look delicious. Our husbands should get together and I have a sobbing party while we pig out on coconut! The strawberry marshmallows I made the other day called for 30 min. of whipping. 15 min. sounds a heck of a lot better for both me and my mixer. I wonder what the difference is? Haha--I haven't tried making cake pops yet, either! Thanks for the details on these marshmallows. Gorgeous!! And so sweet that they're for your little man's birthday - can't believe he's turning 2! I have coconut police here too! Darn them! I forgot to tell you-a few weeks ago my word verification for leaving a comment was "mattao"-so close, but thought it ironic nonetheless. now, that's what i call delicious looking marshmallows! 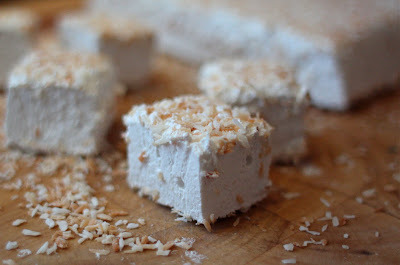 i'm such a huge coconut fan, so these are right up my alley! wonderful job. I just made marshmallows yesterday. Great minds think alike. I made pomegranate marshmallows and they're so pretty and pale pink! Making marshmallows is kind of addicting. I've never made marshmallows, but have always wanted to. The problem is I think I'll eat the whole batch. So I better wait until I have someplace to take them! I watched Barefoot Contessa make them once and she made them look fairly easy. Your recipe certainly doesn't take very long to make...and the coconut is rather appealing. Toasted coconut sounds like a great addition. I have yet to take the plunge into the world of marshmallows! These look delish. I made homemade marshmallows last summer...I should totally make them again. And I'm with you on the macarons--wasted a lot of $$ on almond flour in my failed attempts maybe one day! Those look delicious. Perfect for the birthday boy! Your mallows look wonderful! I wanted to make flavored ones but there were so many recipes that used plain marshmallows so that's what I made. Oh yum... these look so delicious. They would make a great gift! Thanks for sharing. These are amazing! I added almond extract and then drizzled melted chocolate on top after I cut them...I call them Almond Joy marshmallows. Delicious! !